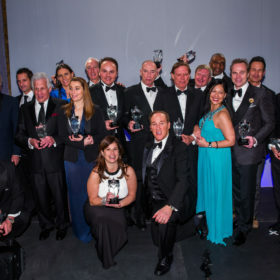 More than 500 guests gathered at the historic New York Public Library to honor innovators of the wine and spirits industry. Rain, sleet and snow did not stop wine industry luminaries from attending Wine Enthusiast Magazine’s 12th annual Wine Star Awards gala on January 28, 2013 at The New York Public Library—an event that honors outstanding achievements of leaders in the world of wine and spirits. Nearly 500 hundred guests in black-tie attire gathered at the historic Fifth Avenue venue to sample top wines and spirits in the library’s Grand Hall before pouring into the Celeste Bartos Forum to enjoy a four-course dinner paired with hand-selected wines. Master of Ceremonies, Adam Strum—Chairman of Wine Enthusiast Companies and editor and publisher of Wine Enthusiast Magazine—kicked off the evening with a warm welcome and a toast to his friend the late David Taub, a 2011 Lifetime Achievement Award recipient. Strum then presented the first Wine Star of the evening to Hubert Opici for American Wine Legend. At 96 years old, the vivacious chairman of the family-owned Opici Wine Group has a meritorious 75-year-long career in the wine industry. Winemaker of the Year went to Jorge Riccitelli of Bodega Norton in Mendoza, Argentina, and Mixologist/Brand Ambassador of the Year was awarded to Angus Winchester of Tanqueray Gin. Michael Madrigale of Bar Boulud graciously accepted the Wine Star Award for Sommelier of the Year, a new category at this year’s event. Robert DeRoose, President and CEO of Kobrand, took the stage to accept the Importer of the Year award, and Michael Binstein, CEO of Binny’s Beverage Depot, was awarded Retailer of the Year. Innovator of the Year went to David Biggar of Vintage Point, and Joe Magliocco, President of Chatham Imports, humbly accepted the award for Distiller of the Year for Michter’s Distillery, located in Louisville, Kentucky. Jean-Charles Boisset, winner of American Winery of the Year for Napa Valley’s Raymond Vineyards, enthusiastically accepted the award after his entertaining James Bond-style video. The award for European Winery of the Year went to Umbria’s Arnaldo Caprai, while New World Winery of the Year was awarded to Israel’s Golan Heights Winery. José Trillo was honored to accept the Wine Star Award for Wine Region of the Year for Ribera del Duero. Miguel A. Torres accepted the Lifetime Achievement Award. Torres joined his family business more than 50 years ago and was honored chiefly for his role as an international ambassador for wine. The last award of the evening, Man of the Year, was given to Joseph E. Gallo, President and CEO of the world’s largest family-owned winery, E. & J. Gallo. Joseph is widely credited for reinventing the company, which was started by his father and uncle, and making Gallo one of the largest exporters of California wine.